The video shows Kashkari riding to Fresno on a bus on July 21, with what they say was just $40 in his pocket. "This has been one of the hardest weeks of my life. I came to Fresno expecting to be able to find a job, and take care of myself. But it's been a week and I've found nothing. 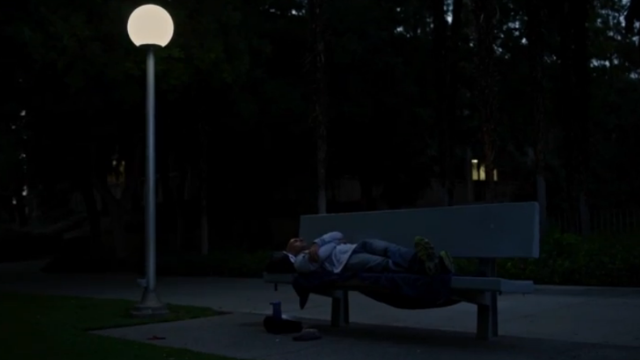 I've run out of money and had to turn to the homeless shelter for food," said Kashkari, in the video, which shows him sleeping on public benches and being turned down as he searched for a job. "While the politicians who run California pat themselves on the back and claim a 'California Comeback,' they willfully ignore millions of our neighbors who are living in poverty," Kashkari said in a statement. "California's most vulnerable citizens deserve leaders who will fight for them – and as Governor I intend to do just that." Public opinion surveys indicate Democratic Gov. Jerry Brown is in the driver's seat as he campaigns this year for an unprecedented fourth term. Brown had a 20-point lead over Kashkari in a Field Poll conducted in June and a 19-point lead in a Public Policy Institute of California survey conducted this month. Brown also appears to have a huge campaign cash advantage, with more than $22 million in the bank. Brown campaign strategist Dan Newman told CNN that he's "puzzled trying to reconcile the bizarre stunt with his cynical refusal to help struggling homeowners when he had the chance, as well as his opposition to the minimum wage and unemployment benefits." Newman also said he's "wondering how authentic an experience this is when (Kashkari's) followed by a paid camera crew before returning to his $10 million beach house." Kashkari, 41, is a former Bush administration treasury official, fund manager and investment banker. He beat out GOP state Rep. Tim Donnelly for second place earlier this month in California's gubernatorial primary. well, I live in that city and I have a few questions? Like where was he bunking down? Because I don't recall seeing any globe streetlights. Not saying we don't have them, but don't know where any are. Second, sounds like he was after white collar professional jobs. Not much call for those here. Now he could have gone out to the farms and got a job picking fruits and vegetables. Does he even know that this is the ag capital of the usa? My thoughts exactly, I would also add that he is against raising the minimum wage too. Neel Tushar Kashmiri, an India dude, so pathetic. He is deceiving public. Pathetic, deport. I would vote for Neel Kashkari if I lived in California. At least someone acknowledges what I live every day and have lived since the recession. Why wasn't he able to find work? Neel Kashkari's public theater is an exercise in futility. He doesn't have any chance of winning the governorship because Republicans make up less than 30% of registered voters. Republican conservatism does not play well in a progressive and diverse state like California. If you read up on what he stands for and advocates, the Republicans will label him as a Rino. He's quite moderate. ANd that is death in Rightyland. I like the way Neel is thinking and prove a point. But 75% in recent survey agreed that illegal immigration is the biggest concerned for them and in CA case too that is the reason why citizens can't find jobs. If he can sell illegal immigration and Brown as their friend, you're looking at much closer fight. Proof that we need more law enforcement patrols at night. He was able to sleep overnight on a park bench in clear violation of the law without a single police officer citing or arresting him. Something is broken in the system. We truly need help cleaning up the streets. I just can't get over the disconnect here. A Republican campaigning on the premise that homeless people are struggling? What next, a Libertarian saying that we just don't have enough government involvement in our lives? With camera crews following, you are not rushed out of the areas that homeless people typically can't inhabit. It is just like Jane Byrne "living" in a Cabrini Green apartment in the 70s. Before she moved in, the entire building was renovated and there was more security there than Fort Knox any time she was anywhere close. As soon as she moved out, things returned to normal. Publicity stunt, nothing else. There is no hope for CA. That became painfully clear, when brown was again elected there, after bankrupting the state, previously. When people are that stupid........there is no way to save them. You just have a bad taste for California because all your children moved there. Homeless ... in Fresno during the warm summer nights. Very doable. Homeless ... for just a week. Very doable. Homeless ... with $40 in his pocket for a week. A challenge ... but doable. Homeless ... without 3 children to care for. The MOST doable. Now then ... if you wish to try a VALID experiment ... try being homeless in the cold rainy winter, with no cash on hand, with three children to care for ... long term. Compared to that reality ... yours is just a stunt. Raise minimum wage to 14/ hour and cut even legal immigration. These two will fix the problem. To live like a homeless person is to live with little or no money and no home and a tomorrow that is no better. Sad and pathetic. The depths these politicians will stoop to. His actions are simply condescending and attention grabbing. Oh, give it up already. Because he's of Indian descent, he's pathetic and should be deported? Deported to where?? Neel Kashmari was born and raised in Akron, Ohio. Where are you from? Perhaps we should deport YOU. But the Obama Administration has demonstrated that it is far better use US tax dollars to aid and abet criminal immigrants than help our poor and homeless. I'm from Stockton and now I'm in Texas. California is in serious trouble, hundred billion dollar deficit, drought that is affecting agriculture, public education that is failing out children. We need more business minded people in office. Secondly, raising the minimum wage will only hurt business growth and less people will have jobs because less companies will be able to afford to pay their workers. It's simple economics, not everyone deserves wealth but some people earn it. It's every citizens responsibility not to ask your government for handouts and fair chances but to create those chances for yourself through hardwork and sacrifice.